0:43 - Why is Assault Such a Hot Topic? While some associations have worked toward making an assault against a process server a felony, others have held assault prevention and safety seminars. For more details on why assault is such a hot topic and what each process server can do to stay safe and protected, we sat down with Davy Keith, president of the Mississippi Association of Professional Process Servers (MAPPS), Steve Glenn, president of the Process Server Association of Colorado (PSACO), and Ruth Reynolds, president of the North Carolina Association of Professional Process Servers (NCAPPS) to discuss process server assaults as part of the PAAPRS campaign. Watch the video for what they have to say about process server assault, assault prevention, their personal experiences, and what associations can do to keep their members safe. After a recent process server assault in Colorado, PSACO held an emergency meeting. The PSACO board looked into getting assault laws changed to protect process servers. The discussion among members included how to stay safe. 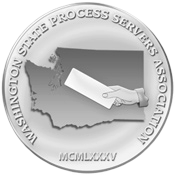 WSPSA worked to pass legislature to protect process servers in Washington last year. Unfortunately, the legislature did not hear the piece. WSPSA Executive Director Eric Vennes discusses how WSPSA is working to keep the issue visible in the video below.